^ 1.0 1.1 Park, Edwards. 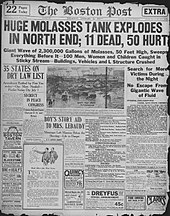 Eric Postpischil's Molasses Disaster Pages, Smithsonian Article. Eric Postpischil's Domain (Smithsonian Institution). 24 November 2004, 14 (8): 213–230 [2006-12-16]. ^ 6.0 6.1 12 Killed When Tank of Molasses Explodes (PDF). The New York Times. January 15, 1919: 4 (January 16, 1919) [2008-05-30]. ISSN 1553395 请检查|issn=值 (帮助). 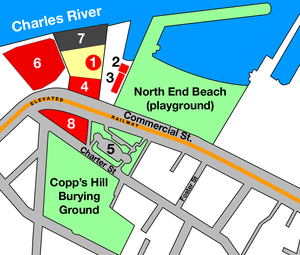 ^ Great Molasses Flood. Massachusetts foundation for the Humanities. [2006-12-16]. ^ The Great Molasses Flood of 1919. The Ooze. [2006-12-16]. ^ What caused the great Boston Molasses Flood?. The Massachusetts Historical Society. [2008-06-16]. ^ 11.0 11.1 Was Boston once literally flooded with molasses?. The Straight Dope. The Chicago Reader. [2006-12-16]. ^ Places to go 互联网档案馆的存檔，存档日期2013-09-13. ^ Boston On-Line: Disasters 互联网档案馆的存檔，存档日期2012-07-28. Puleo, Stephen. 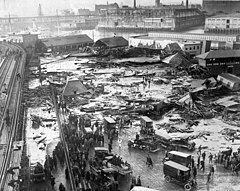 Dark Tide: The Great Boston Molasses Flood of 1919. Boston, Massachusetts: Beacon Press. 2004. ISBN 0-8070-5021-0.